First an announcement – Yellow Stonehouse Farm’s Open Farm Day is this Saturday, May 20th from 10:00 till 2 pm. Everyone is invited to come, both members and those who are just curious about the farm. Come see us, pick up some asparagus or rhubarb and maybe a few wild greens. Be careful what you wish for, is a saying my parents would send my way whenever I said I wanted something. Here’s another – When it rains it pours – usually referring to a deluge of problems not actual rain. Well – this Spring, it seems we are experiencing both an actual deluge, as well as problems, caused by way too much rain but also the end of the drought. The pendulum swings: in 2016 we wished for rain; in 2017, not so much. Wish fulfillment is tricky. So, I am going to be careful, and not wish for an end to the rain – just a little decrease. 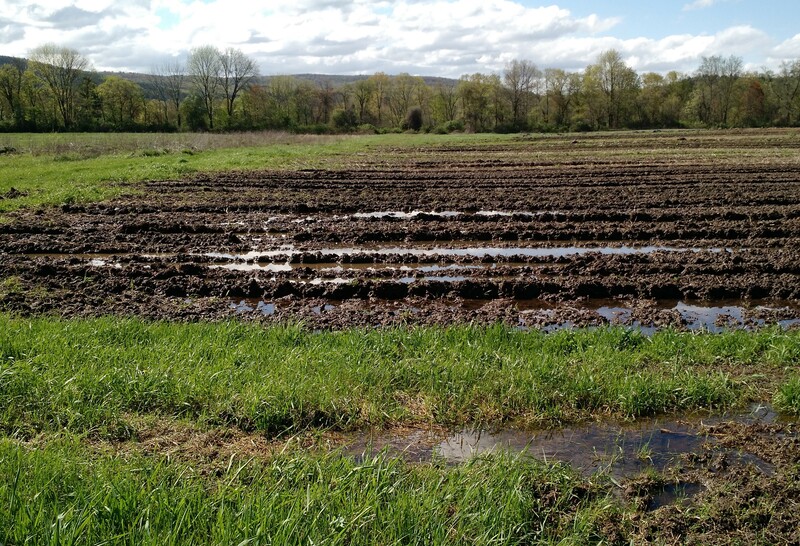 So – as you can see – we’ve been blessed with an over-abundance of rain this Spring and its causing a few issues with getting our crops in the ground. When It’s muddy like this we can’t plow, or get the beds ready or even walk around in the fields much. 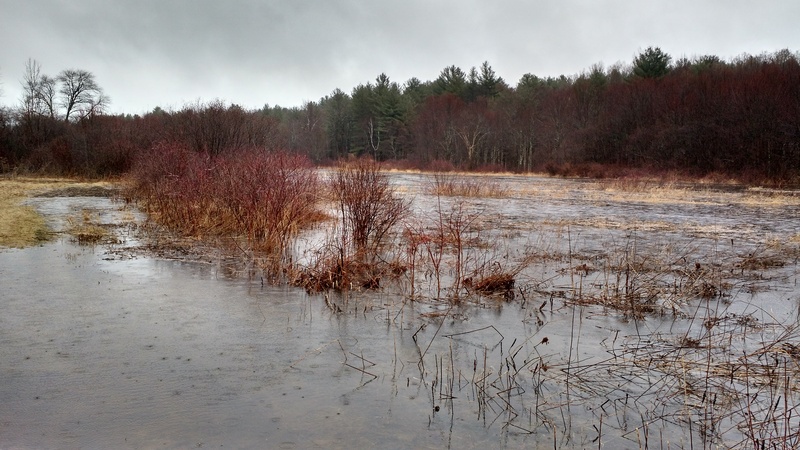 During the bird walk last Sunday, our birders had to deal with 16 inches of water in the back pastures – making it difficult to get to certain bird habitats. The peas we planted in March are having a hard time, and we suspect that many of the seeds have rotted – which we will rectify this week by reseeding. Even picking the asparagus can be a bit tricky – I’ve lost a boot or two to the mud, resulting in very wet feet. 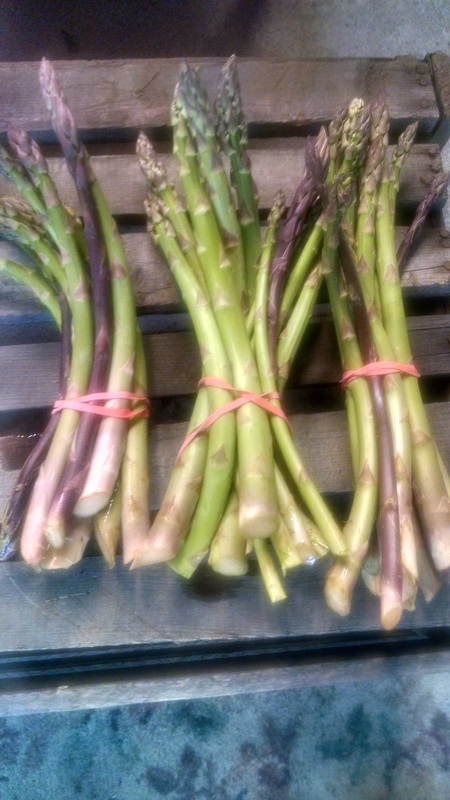 CSA pick-ups are still on schedule for an early June start through October, however. Also – as a reminder, of the extra 27 spots we added, there are only a few remaining. We encourage everyone who is going to sign up for a share, to do so as soon as possible. We are planning and planting for the summer right now, and we need to know how many members we will have, to do so efficiently. That’s the deal with a CSA – the farmer knows how many shareholders to plant for and can thus be as efficient as possible in how many seeds to order and grow and plant. It’s a win-win: for the member, who gets all sorts of wonderful produce and the farmer, who knows how much to grow due to a reliable customer base. Though we still have a few organic CSA shares available, some pick-up days are filling up fast. Call us at 413-562-2164 or email us at the farm at yellowstonehousefarmcsa@gmail.com for more information or come visit during our Open Farm day this Saturday, May 20th between 10:00 am and 2:00 pm. Why CSAs are so Great! CSA or Consumer Supported Agriculture, a model for connecting consumers to local farms, originally started in nearby Great Barrington, MA in the 1980’s. CSAs invite consumers to share the risks and rewards of their local farm who in turn provides fresh, and in our case, organically grown vegetables in exchange for an upfront membership pledge & payment. CSAs are truly a win-win arrangement for both consumers and farmers! Consumers conveniently obtain a wide variety of freshly picked vegetables over an extended season (June – October) at an affordable price, know where their produce is coming from and how it was raised; while the farmer knows how much to grow to deliver the right amount directly to her customers, while cutting out the middleman to make a reasonable profit! This allows the farm to continue being a farm – rather than becoming just another tract of houses! Today, there are over 13,000 CSAs nationwide which has led to a resurgence of small family owned farms throughout North America, reversing a decades long trend of decreasing farm ownership. CSAs also lead as producers of more nutritious, organic and sustainably raised food, as opposed to industrially raised food lower in nutrients and laden with pesticides and insecticides. 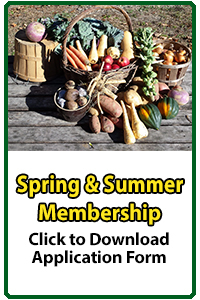 Yellow Stonehouse Farm CSA members not only receive an abundant share of many types of vegetables (we may have over 15 different items in a share) they also get access to the farms Pick Your Own (PYO) vegetable, flower and herb gardens. This includes vegetables such as peas, cherry tomatoes, beans, flowers, and herbs such as basil and parsley! We also grow garlic, ginger, turmeric & horseradish as part of our healthy food activities. Some CSAs provide additional benefits. At Yellow Stonehouse Farm, for example, we find that connecting families & children with the land, demonstrating how food is grown and how delicious it is when it’s really fresh, is an important part of our mission. We host school groups for on-farm learning and lead nature walks to our certified Vernal Pool and Turtle Nesting area. We also make sure our members know what to do with all the different vegetables they receive by providing weekly recipes. We still have a few Every Other Week Shares available for most pick-up days – but the sign-up period is closing soon. Please call us or stop by the farm Tuesday through Saturday. 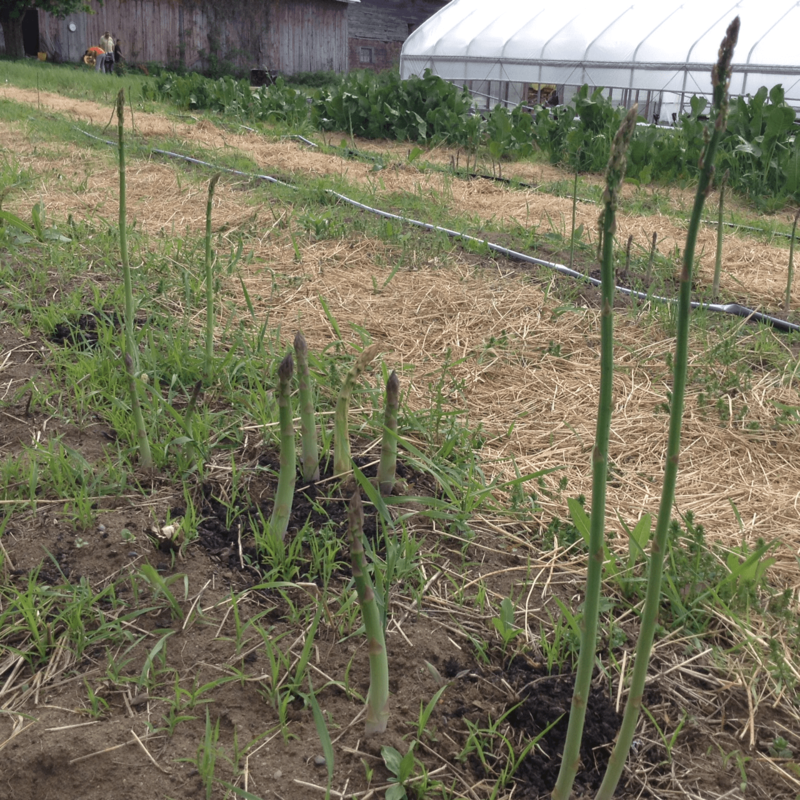 We also are selling fresh organic Asparagus!